The Rivera Venus Recording has quickly become my new favorite piece of gear. I loved the Venus 5 & RockRec combo, so this amp was a no-brainer choice for my needs. It’s the new amp I’m running for all demos, Instagram videos, and general playing and recording for other purposes. Basically, it nails similar clean tones to the Venus 5 with the full speaker emulation section of the RockCrusher Recording. The crunch channel is even more versatile than the Venus 5 as the VRec has additional mid-sculpting options thanks to its 6-position Voicing knob. Most importantly, the Venus Recording has 2 effects loops, one that’s foot-switchable between the pre and power amps with Send & Return level controls and one after everything before the Recording Output. This provides lots of options for effects placement. I’ll also typically always run a Keeley GC-2 Limiting Amplifier in effects loop 2 as a transparent brick wall limiter to prevent audio clipping while recording. Here’s a demo I made showing some of the diverse possibilities of the Venus Recording. And here’s the second most important piece of review gear in the arsenal: the Rivera RockCrusher Recording. Regardless of which other amp I’m using, it’ll always be connected to the “RockRec”. The RockRec is still one of the most indispensable tools in my musical arsenal, especially for recording and is the best product I’ve encountered for getting a consistent sound from a tube amp head, especially when recording at low volume levels. attenuation and showing some examples of using the 11-band analog EQ. I originally needed a way to record a tube amp head with consistent results and discovered the RockCrusher Recording while researching the Rivera SilentSister Isolated Cabinet which is one of the best iso cabs available since it doesn’t have that air-sucking problem suffered by lesser iso cabs. But with an iso cab you still get one sound from the single speaker, maybe 2 sounds if you mount more than 1 mic inside the unit. 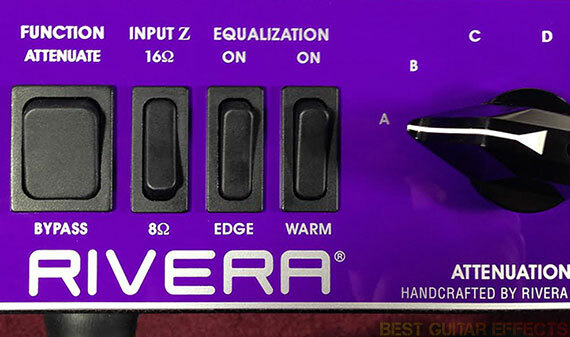 I was pleasantly surprised to discover that Rivera also made the RockCrusher Recording, a solution providing an even more convenient way to record an amp head and with way more tonal options available. The load box and power attenuating features are great for enabling full-on cranked tube tones, but the real boon of the RockCrusher Recording is its all-analog “speaker emulating” EQ section. This allows you to shape the EQ curve for an infinite amount of possible voicings. This is very useful for emulating the sounds of classic speakers or sculpting an EQ setting that just sounds right to your ears or that is perfectly matched to the amp head you’re using. The latest Best Guitar Effects review videos I’ve done feature the Rivera RockCrusher Recording (as will all those to come). It’s just so far ahead of its class in terms of what it does and how well it does it. 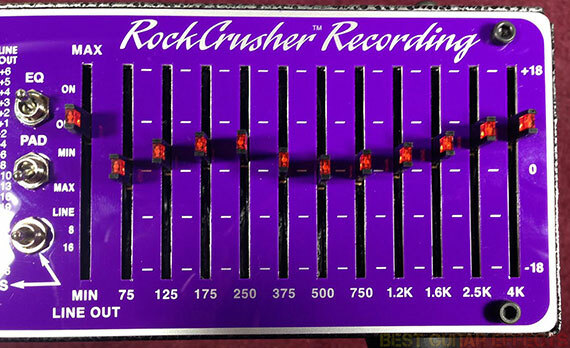 The RockCrusher Recording has been making its way into many pro studios, and home studios will also benefit from the unit’s silent and low volume recording abilities. Even Slash has been recording with the “RockRec” on his latest album. You’ll definitely be hearing the RockCrusher Recording on a lot of albums and songs in the coming years as it will continue to be a go-to recording tool that professional and home studio producers alike will use to record guitars with amp heads. While we typically focus on reviews of effects pedals, this piece of gear is so important to Best Guitar Effects that I wrote an in-depth review for it. When it comes to guitar amps, there are so many factors to consider that I could write an ongoing series about choosing a guitar amplifier that would probably continue indefinitely. As far as big name amp companies go, Fender, Marshall, Vox, and many others have long-standing reputations and many available amps with distinguishing factors. I’ve often regarded the 1959 Fender Bassman as my all-time favorite amp. I was also fond of a Peavey Classic 50 4×10 half stack, a workhorse live amp that was once gifted to me. And for years my main performance amp of choice was a Mesa/Boogie Triple Rectifier. But I recently decided to get my hands on a modern amp that would give me the best clean foundation for building my sound in conjunction with the effects pedals I use and review on the site. The amp I chose was the Rivera Venus 5 head. Now that I’m mainly using the Venus Recording, the Venus 5 is my backup amp or the amp I’ll use for stereo demos (See the Strymon DIG, Eventide H9 Max, & Strymon Deco for examples). The Rivera Venus 5 is a Class “A” head powered by 6L6 tubes which are known for their high headroom and top-end sparkle. I decided first and foremost that I needed an amp for Best Guitar Effects that would provide a pristine clean sound for demoing and reviewing pedals, and the Venus 5 fit the bill perfectly. Just watch this video and listen. I love the Venus 5 head. It has a versatile and overall great sounding clean channel. I became a fan of Rivera in the early 2000’s after a friend turned me on to Rivera’s Knucklehead. It was much later when I developed a taste for quality cleaner amp tones that I learned more about Paul Rivera’s distinguished pedigree of amps, his most notable early design being the Class “A/B” 6V6 equipped Fender Super Champ. While my crunchy tone tastes are “heavier” on the distortion spectrum, I found myself drawn to the Venus 5 particularly for its cleaner sounds. 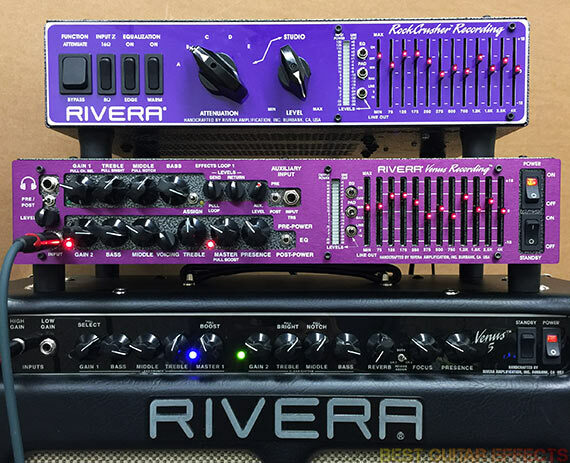 Rivera’s other Venus amps, including the Venus 3, Venus 6, and Venus Deux, are 6V6 based like Rivera’s classic Super Champ. The Venus 5 forgoes 6V6’s in favor of 6L6’s akin to the Fender Twin and reissue Bassman amps. While the tubes alone aren’t enough to define an amp’s sound, they still help the Venus 5 lead you towards a ballpark realm of those famous “blackface” and “tweed” tonal qualities. Of course, when paired with the EQ shaping abilities of the aforementioned Rivera RockCrusher Recording, you’d be surprised at how you can coax the Venus 5 (or any amp really) into sounding like another amp entirely. 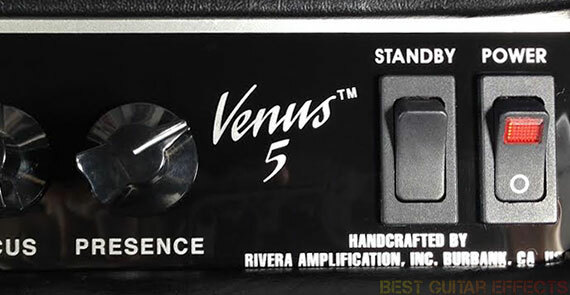 The Venus 5’s Clean/Rhythm channel has a clean tone with a hint of grit when pushing the Gain up towards the sweet spot range of 10-2 o’clock (I mention such a wide range because my preference is always changing). It’s very responsive and exceptionally dynamic, and overdrive pedals can be used to push the amp into further breakup when needed. There’s also a series effects loop which I sometimes use when reviewing reverb and delay pedals. The Crunch/Lead channel offers more articulate, yet spongy distortion with some singing sustain. I use this channel less often than the Clean/Rhythm channel, but it is useful for classic Marshall-esque distortion tones that work well when testing pedals with contrasting textures. When starting the site I happened to have a mountain of old Monster Rock cables. These were decent enough, but I eventually decided that to preserve the integrity of using the best possible equipment and gear money could buy, the marketing-hyped Monster cables had to go. I ended up settling on a particular cable brand: Evidence Audio. When it came to cables the first issue to solve was which cables to use for connecting pedals on my pedalboard(s). Evidence Audio’s Screw-In-Solderless, or SIS, end plugs are quite small and allow more pedals to fit closely together. 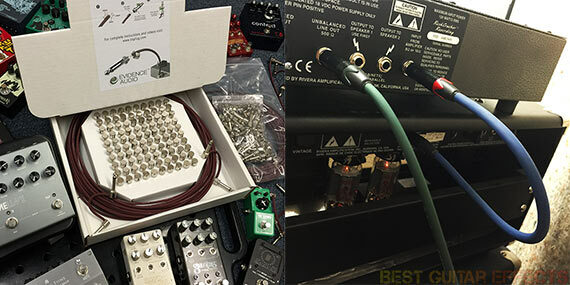 The SIS plugs are used with Evidence Audio’s Monorail instrument cable to create pedalboard patch cables of various lengths. They’re fairly easy to assemble and provide impeccable sound quality thanks to their tight connection and the Monorail’s solid copper core. (For more info read my Evidence Audio SIS Patch Cables review.) All other instrument cables are the Evidence Audio Reveal, a cable that aims to provide a more transparent and pure signal integrity than typical guitar cables. For connecting the Venus 5 head to the RockCrusher Recording I use a single 1 foot Siren speaker cable to ensure optimum signal transfer with the least possible resistance. Evidence Audio cables are designed to interfere with your sound as little as possible without all the flashy marketing hype. In use they simply sound great. If I do end up using different cables, it’ll most likely be if I decide to try the Evidence Audio Lyric HG or Forte instrument cables. 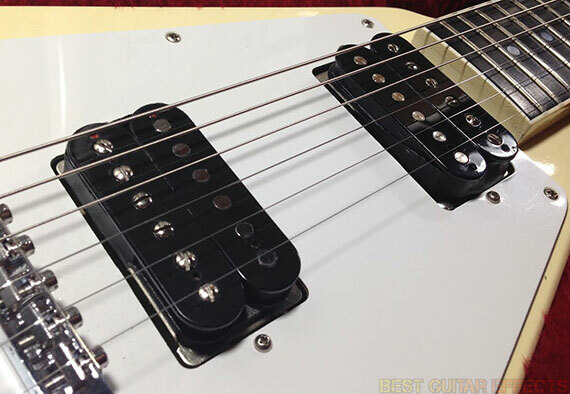 While there are many schools of thought when it comes to ideal guitars, there are two common camps in terms of pickups and guitar types/body shapes/configurations. I regard these as the single-coil & humbucker camps. (What, no love for P-90’s? I love ’em. They’re just not as common as the other two.) The guitars mostly associated with single-coils are the Fender Stratocaster and Telecaster range. 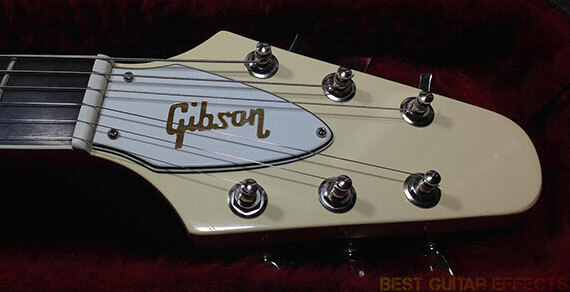 Humbuckers are prominent on most Gibson guitars such as the Les Paul, SG, Explorer, and Flying V lines. I typically use one guitar equipped with single-coil pickups and one equipped with humbuckers during my reviews. 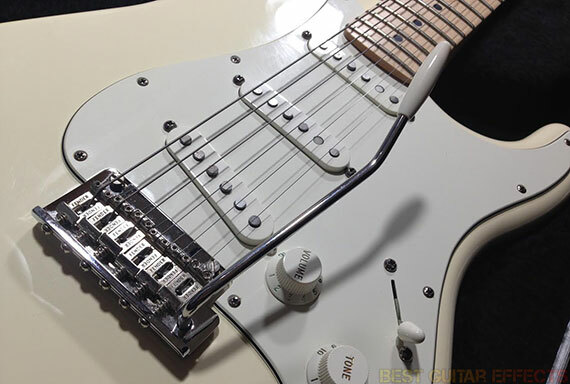 Covering the range of single-coil tones is my 2008 Fender American Standard Stratocaster. My first guitar was a cheap Squire Strat, and even though I had switched to playing a Gibson SG primarily for years, I suddenly had the desire in 2009 to pick up a modern Strat again. I walked into one of the big box guitar stores and picked up a Standard Strat and fell in love. That seemed easy enough, but I put off making a buying decision that day. I came back a week later, pulled a Strat off the wall from around the same spot in the same color and plugged in to the same amp as before. Something entirely different happened. Those full, beautiful tones that I heard before were gone! This guitar sounded absolutely dead to me! Then I looked at the headstock and realized I had picked up a Fender “Deluxe” Stratocaster by mistake instead of a “Standard”. The super fancy, noiseless, blah blah blah pickups of the higher end model just weren’t doing it for me. I switched to a Standard and fell in love all over again. There’s something about the no-frills, workhorse American Standard Stratocaster that just nails classic playability, feel, and tone. So shortly after I posted about looking for my dream guitar, a Gibson 1981 Flying V in original classic white, I found this 1982 Flying V from a seller online that happened to be here in Los Angeles. I almost passed it by since it wasn’t an ’81, but the guitar was in such good condition that I had to play it. I contacted the seller, had him bring over the guitar for a test drive, and ended up buying it on the spot. While I may still be interested in an ’81 V if it’s in great condition and the price is right, this ’82 Flying V is totally doing it for me. I decided to really make it mine and make a few alterations. My favorite humbucking neck pickup is the Seymour Duncan ’59 (SH-1N). I’ve used one of these in my favorite Gibson SG for 10 years and still love it, so it was a staple for me to have a ’59 in this axe as well. While my trusty old Gibson SG has a Dimebucker (SH-13) in the bridge (R.I.P. Dime \m/), I decided to go with a Seymour Duncan Custom Shop 35th Anniversary Commemorative JB Model (SH-4) in the Flying V. This is still a pretty high output pickup that remains very defined and musical for most playing styles. I replaced the original classic tuners with new Gibson Modern Machine Heads that are manufactured for Gibson by Grover, a company known for their high quality tuning pegs. I like that the tuning keys of these modern tuners look similar to the classic style of the originals while greatly improving the tuning stability of the guitar. While I typically change pickups myself, I had a local guitar tech wire them up while changing the positions of all 3 knobs counter-clockwise for more ideal positioning of the bridge and neck pickup volume controls. I also had the tone knob rewired to only affect the neck pickup. This allows me to always keep the bridge tone fully open while being able to switch to a dark neck pickup sound with the tone knob rolled back. When using the neck and middle pickups for clean tones I can adjust the overall sound to taste by altering the response of the neck pickup via the tone knob. This guitar plays beautifully and is pretty much my ideal in terms of a humbucker equipped Gibson-style guitar with Tune-O-Matic bridge and stopbar tailpiece. These are the main pieces of gear I use for reviews although a few other items do come into play. Our early videos used Monster Rock cables for connecting pedals. I just happened to have a ton of them. But I recently switched to Evidence Audio as the large end jacks of the Monster Rock cables made wiring in tight spaces somewhat difficult. I also sometimes use a couple Peavey Classic 50 cabinets, a 4×10 and 1×15, that I really like. They’re great for getting a tight and punchy amplified sound with a massive bottom end, but the RockCrusher Recording sounds so good that I typically prefer to forgo miking cabinets for any reason and find myself running direct into a recording interface. I’ll update this page if I find any other amp, guitar, or relevant gear that becomes a staple for reviewing gear on Best Guitar Effects. That concludes my Best Guitar Effects review gear. Thanks for reading. Interesting to say the least. I didn’t need to be five minutes into your vid of the Rivera Venus Recording to realise that it can modify your sound a little more than somewhat. I’d have thought that a simple, totally clean amp designed purely to give you the actual sound of your guitar would be the best way of analysing the effect an, er… effect, is having on your sound. As for the guitar, I’m a little torn here. Like you, and countless dozens of other guitar players out there, I have some favourite guitars with favourite guitar sounds, in fact with one exception I wouldn’t buy a guitar if it didn’t have a sound that I like, no, make that ‘adore’ (I can be a little eccentric). But the fact is, most guitarists buy a guitar and play it in an amplifier that they bought because, like the guitar, it’s used by their favourite axman, and the thought occurs to me that maybe you should be testing effects with a totally bland guitar to match the totally bland amp. Thataway nothing is colouring your sound except the effect. Of course, there is another facet to guitar wrangling that always gets ignored in everyone’s reviews. Studio testing is all very well, but how does the effect stand up to being used in anger (i.e. live)? As I may have mentioned once or twice before, some dreg of humanity stole my effects bag (May the spit of 10,000 llamas hit them in the face every time they attempt to eat) so, not being made of money, I’m having to restock my pedals as cheaply as possible via Ebay, and I’ve had the odd surprise. Performing live some really cheapo cheapo pedals sound just as good as their boutique counterparts. Onstage a Boss CS-2 is more than up to the task of replacing a boutique compressor and a boutique booster combined, just don’t get me started on the CS-3 which is an abomination, why would anyone need a tone control on a compressor? Augh, between the guitar and the amp I’ve got quite enough tone controls already thank you. When I’m boss of the world all tone controls will be eliminated and everyone will be forced to listen to the unadorned sound of the guitar coming out of the amp. I told you I could be a bit eccentric.